The first festival began in 1967 as part of a Centennial celebration. Winona planned 4 different Festival Days, they were meant to cover the peak periods of the fruit growing seasons. The first was the Blossom Festival, held on Friday May 19th @ the Winona High School. This is where the crowning of the Blossom Queen was held. The second festival was the Strawberry Festival held on Wednesday June 21st at Winona Park. At the Strawberry Festival different organizations dressed in old time costume and served foods. Town Centennial Festival was held at Winona Park on July 1st. It started off with a parade, included musical performances, a carnival and ended with fireworks. There was also a dedication of the Park Entrance by the Women's Institute. The Festival of Fruit began on Friday August 18th and all day Saturday August 19th. Winona Road was closed between Hwy #8 and Barton Street. The road was painted peach, plus we had an outdoor market with a large assortment of fruits was set up. There was a street dance, entertainment, a buffalo roast and antique machinery. A baseball clinic was organized at Winona Public School, put on by the Buffalo Bissons. An Interdenominational Church service was held on Sunday June 25th in the park, combining the choirs and congregations of Christian Reformed, Ebenezer Reformed, St. John’s Anglican, Winona Gospel, Immaculate Heart of Mary, Wesley United and Fifty United. This tradition was carried in 1982 and 1983. The Centennial celebration began as four separate events, each being a one day event for many years but in 1977 grew into a three day event and has always been held in Winona Park. 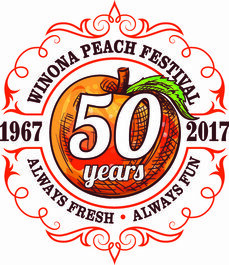 Winona Peach Festival became incorporated in 1982. The first pageant was run by Cam Hooton and John Van Essen. The first Queen crowned was Johanna Van Essen with Georgina Smith and Lindsay Poole as her ladies in waiting. The pageant contestants were required to be between 16 - 21 and from the Winona - Grimsby areas. There were 18 contestants in 1967. The contestants wore colourful costumes dating back to the late 1800's and early 1900's. The contestants were judged on personality, talent, poise, interests, ambitions and dress. The Queen received a $100 bank account with the account number 1867-1967. The cost for entering the pageant was $10.00. The next pageant wasn't until 1974 and it was run by Jean Swackhammer. This was the beginning to the present day pageant. The contestants had to reside in the City, (Town) of Stoney Creek, be sponsored by WPF member organizations and be between the ages of 16 – 19. This is still the criteria! Over the years, the girls received $100 and had to purchase their outfit and turn in the receipts to the Pageant committee. Their ability to spend wisely was one of the areas that the girls were judged on. The contestants now receive $125 to outfit themselves for the pageant. Contestants are still judged on their poise, personality, dress and now they are also judged on their public speaking ability in both a speech and impromptu questions. Pageant Chairs over the last 40 years have included: Cam Hooton, John Van Essen, Jean Swackhammer, Sandra Yemm, Patti Gunell, Brenda DellaMaestra, Susanne Roubos, Debbie Marrone, Leanne & Andrea Baird, and most recently Melissa Shuker. The first dance was a street dance and now we have the Grand Peach Ball. The Grand Peach Ball has always been held in July and closely follows the pageant so that the new Queen and Princesses can begin their duties. One year we even had a Peaches & Cream Ball for the younger crowd. Originally the entertainment took place on a flat bed truck on Winona Road and has now evolved into the Entertainment Main Stage, with entertainment for all ages. The E.D. Smith Fun Factory began in 1979, as a separate stage and was totally committed to bringing children’s entertainment. In recent years the Fun Factory has moved onto the Main Stage. Over the years, we have had many special events, such as Sky Divers, hot air balloon rides, wandering minstrels, we also had a person go for a Guinness World Book record of being under water for the longest to name a few. There is still a closing ceremony each year on the Main Stage, when the draw tickets are drawn. We used to have an opening ceremony and a ‘Walk Around’ that was led by the President and the Queen & Princesses. The ‘Walk Around’ was introduced so that local dignitaries; such as the area Mayor and councilors, could view all of the various areas that make up Peach Festival. In 1987 Premier Peterson joined us. The ‘Walk Around’ was followed by a VIP reception. The small town carnival has grown to our current Amusements area in the Winona Festival Field (Bacic) with many more rides. We still have fruit vendors in the park but not the outdoor market that they held in the first year. The Commercial area originated with the antique machinery at the Fruit Festival and in 1985 grew, so that the men had something to do, while the women were in the Arts & Crafts area. The Arts & Craft area began in 1976 and has grown over the years and now has over 100 crafters. All crafts have to be hand made and cannot be commercially made. Many different foods being served by the organizations has always been a part of Peach Festival. The Winona Peach Festival was the first festival to offer alternative food choices, including vegetarian and gluten free products. Many of the organizations have products that include peaches! The first festival had a baseball clinic. In Winona Park we have hosted Firemen/Police games, baseball and soccer tournaments. In later years Saltfleet Go Ahead Soccer moved the Peach Festival Soccer Tournament to Sherwood Park. Peter & Paula Peach have been the mascots for the Peach Festival since 1981. These wonderful Peaches have accompanied the Queen & Princesses to many parades. Peter and Paula have cheered up many people at local nursing homes. Peter and Paula are a favourite for all ages. For our 50th Anniversary, we will be unveiling our new Peter and Paula. In the 1967 parade, there were many antique cars. In 2002 the “Peach of a Car Show” was born. Local owners bring in their older cars for everyone’s enjoyment. A shuttle bus for area for seniors was started, which picks them up and takes them to Winona Park and returns them to the pick point. Once our major parking area across from the park was bought, we began providing shuttle bus service from our off-site parking, for many years our parking was at Helderleigh Holdings (formerly E.D. Smith farm). Currently our parking is at Puddicombe Farms, we still provide shuttle service from there. In 2013 the Hamilton Street Railway (HSR) became a Peach Festival partner, providing free transportation from Eastgate Square. While there is some handicap parking available on-site, both our shuttles and the HSR have busses that make it accessible for wheelchairs, walkers, motorized scooters and strollers. We still have a baby change tent available to assist young families, including seating for nursing mother’s. Peach Festival has always had a grounds crew that is responsible for the set up and take down of the festival. It is our grounds kids that remove of all the garbage throughout the weekend and are involved in helping us become more ‘green’. 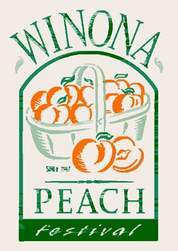 The Winona Peach Festival was involved in the very first pilot project to reduce garbage at an event. Since that time, we have tried various initiatives to help reduce our foot print. The Peach Festival has changed and grown over the years. Our Midway (rides and games) has moved from the south ball diamond to Festival Field (previously known as the Bacic lot). This area has become our entertainment area, various displays and a couple of food booths. The north baseball diamond used to host our entertainment stage, the bingo tent plus a few Commercial Exhibits, since moving the Entertainment stage, this entire area now hosts approximately 100 commercial vendors! The Arts & Craft section has grown to approximately 100 crafters/artists. Peter and Paula will soon be going through a revitalization and will be ready to greet the world in our Anniversary year. We still provide a Fish Pond for children at a great price. Our Queen and Princesses still represent the Peach Festival at various functions. Our close parking has been changed into shuttle services from our own parking lot and Eastgate Square, giving more people the opportunity to visit the Winona Peach Festival. Involvement in the Winona Peach Festival is a community affair. There are many families that were involved in the first festival and are still involved including several generations. WPF is the only festival that is run entirely by volunteers. We have no paid staff. The first festival had approx 6 organizations involved. Now there are 19! All organizations are required to meet the following criteria; be community based churches, sports and service organizations or other non-profit community minded groups located in and serving, Hamilton (the former City of Stoney Creek). 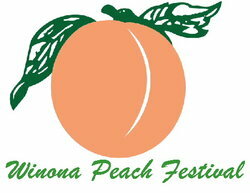 The organizations are the Winona Peach Festival and every year they elect a Board of Directors to serve for that year. The Board of Directors are directly responsible to the General Membership. There are several committees that take care of the running of Peach Festival and every year the chair for that committee is approved by the Board and then by the General Membership. We are the only festival that is run this way. The monies made at Peach Festival are directly funneled back into the community. For many organizations Peach Festival is their biggest fund raiser. The community greatly benefits from Peach Festival because the organizations purchase their products from local area merchants, our visitors purchase food and items at the Festival, visitors stay at local hotels/motels, they also visit some of our local attractions which creates a beneficial cycle of cash flow into the local economy. The Winona Peach Festival has something for everyone! Our motto is "People working together for a better community".